Everyone and their grandmother seems to have a favorite microbrew IPA, weiss, sour, or saison. 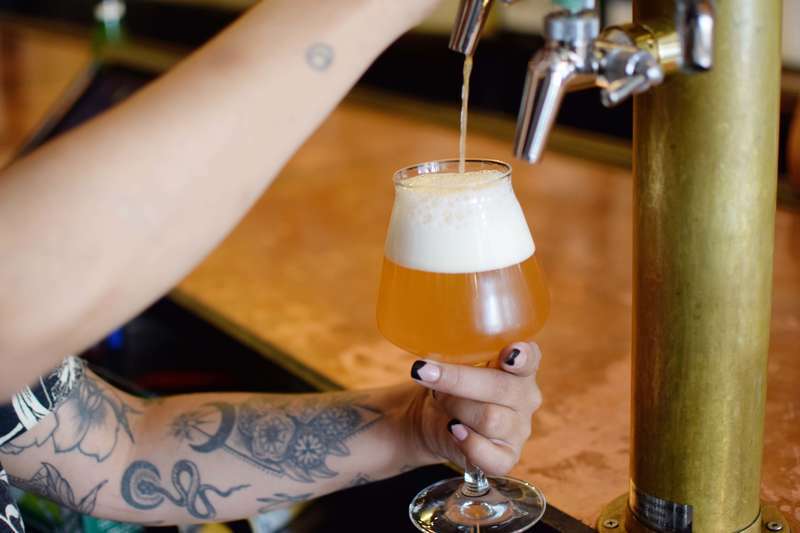 Amid NYC’s estimated 10,000 licensed bars, finding a taproom to satisfy die-hard beer nerds can feel like chasing a truffle pig through the woods: You hope you’re onto something precious, but it might just be a rotten apple. We’ve culled the herd and separated the hops from the nots. To narrow things down, we’ve excluded breweries and joints without draft lines. The resulting watering holes span each of the five boroughs and offer something to suit nearly every taste. Each spot executes a palpable mission to provide a purposeful, thoughtful, beer-centric experience. And we know and love that you’ve got your favorites, but fear not: A visit to any of these suds-slingers promises to send even the fussiest hop-head to heaven. Sixteen pristine draft lines are only the beginning of what Covenhoven (Cove-in Hove-in) has in store; You could get lost for hours perusing more than 100 different bottles of beer and cider in the peer-in fridge that spans half the bar’s length. The wide variety, build-your-own charcuterie boards, and super-cool, super chilled-out vibes have made this spot a local favorite. A staggering 70+ beers on tap, cask bitters, comfort food, helpful staff, and the spacious taproom’s warm, old-school Irish charm combine to give The Ginger Man its undeniable draw. The bar is crowded after work when the Midtown crowd shuffles in, and on weekends when the area’s recent former frat boy crowd comes alive. Your best bet is to visit during the day, or walk out with a bottle and/or growler at a 15% out-the-door discount. This enormous yet inviting 4,000-square-foot, 220-seat Czech-style beer (bier?) 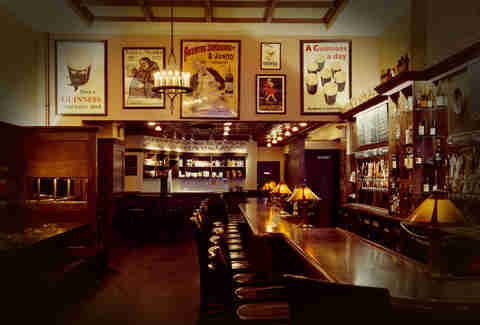 hall serves its respectable variety of 17 drafts and 23 bottles from a annular bar. Beside serving you great suds, Bierocracy’s mission is to foster neighborliness -- so learn to love communal tables and expect to see strollers parked here on weekends. The food menu is chockablock with variations on Central-European fare: pretzels, goulash, schnitzel, and wurst. Who doesn’t love a wurst? 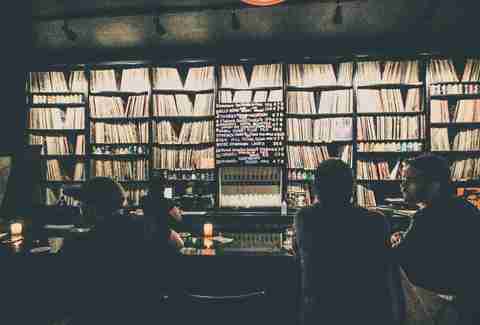 Both the craft beer and vinyl record communities are animated by connoisseurship, and their synthesis at BierWax feels hand in glove. Passionately selected music from more than 5,000 records, featured DJs, a full calendar of events, seven bottles, 27 cans, and 12 carefully curated taps unique to the Northeast give this place all the makings of an institution. The French doors that open onto South Brooklyn’s loveable Smith Street drag; stamped-tin ceilings, the brick walls, the string lights, the pinball machines, the local community, the unfussy and accommodating atmosphere, the rad music, the friendly bartenders, the selection of over 60 craft beers -- Bar Great Harry does the impossible: Without a hint of pretense, it marries everything that makes the ideal neighborhood bar with a sophisticated craft beer destination. A true treasure. Every one of this year-old up-and-comer’s 20 rotating draft beers hail from The Empire State -- likewise most of its bottles and cans. Beside a commitment to locavore consumption, Solid State offers seven different pinball machines, including ultra-rarities like Tales from the Crypt and Super Mario Brothers. If you aren’t feeling lights, balls, and paddles, there’s also a wide selection of board games so you and your gamely friends can park it here all night long. 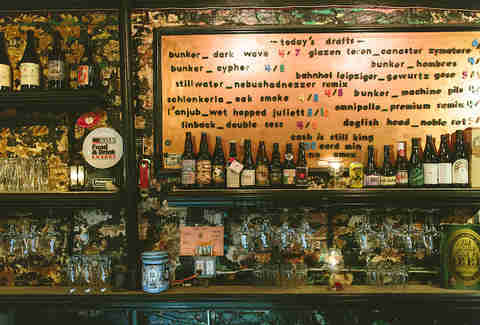 No craft beer bar list would be complete without the place most consistently cited as Manhattan’s archetype genre joint. 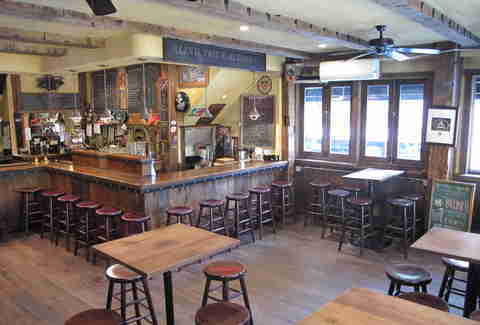 On the picturesque yet gentrification-blighted Bleecker Street, pub-style Blind Tiger’s dark wood barroom boasts 28 taps and more than 20 bottles. The weekend crowd skews bro-y, so swing by early on a Wednesday evening for a beer and free cheese soiree furnished by nearby Greenwich Village stalwart, Murray’s Cheese. 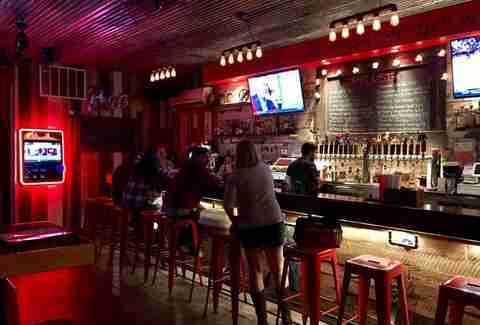 Since opening its red doors in 2003, Spuyten Duyvil has more than earned its reputation as a Williamsburg staple. The funky, intimate bric-a-brac adorned interior flows into a spacious backyard. Sporting just six taps, this craft beer pioneer focuses on rare bottles from around the world, including Japanese Sake and German brews. The house specialty is a selection of Belgian bevs lovingly arranged by region. 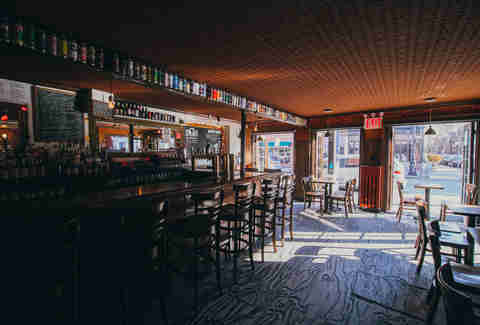 This hip South Bronx beer mecca in the shadow of Yankee Stadium proudly features nearly 30 drafts and more than 30 cans/bottles. The food is what you’d imagine, but that’s not a bad thing. Stop in here for happy-hour after a day at the Bronx Museum of the Arts or before a game, and feel the charming neighborhoody appeal of Gerard Avenue while you plan your post-L-pocalypse move. Straight lines, shining surfaces, clean angles, and nary a shadow in sight -- you may feel like you’re walking into a dream Stanley Kubrick once had about a bar tended by HAL 9000, but rest easy: everything here -- the burgers, cheese plates, the beer temperatures -- is precisely calibrated to satisfaction. Enlist a thirsty friend and order small pours to taste everything on tap. Twenty-one drafts, more than 250 bottles and cans, one mission: the perfect experience. With easy pride in both its neighborhood and wares, this spot reserves its 16 taps for local suds, with a focus on brewers of color. 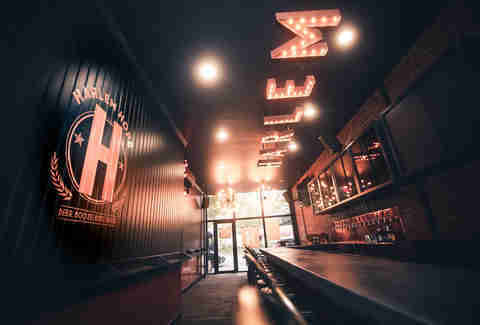 A wide beer selection, back patio, tasty bar snacks, great music, and a wonderfully welcoming staff give Harlem Hops its air of sophisticated cool. The neon sign on the wall reads: I fell in love with Harlem before I ever got here -- a sentiment easily applied to the bar itself. 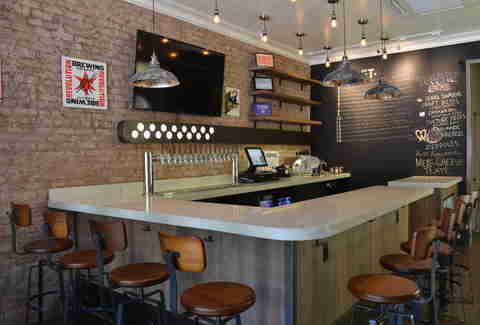 The commandment emblazoned on the wall of Staten Island’s premier (non-brewery-affiliated) craft beer bar decrees: Thou shalt not worry, but rather be hoppy. Amid campy décor, skee-ball, and arcade cabinets; boozy milkshakes, a flamboyant menu of bar food that would make Guy Fieri proud (PBJ double burger, bacon cheeseburger quesadilla, build-your-own mac & cheese), and a selection of 20 drafts alongside nearly 60 bottles and cans -- fun is what thou wilt have The Hop Shoppe. Hidden beneath the Queensboro bridge, this ambitious establishment is an espresso bar by day, and a craft beer haven by night. Alongside nearly 30 meticulously chosen drafts, a healthy selection of wines on tap, a fulsome cocktail menu, and a kitchen-sink bill of fare (including popcorn, oysters, burgers, charcuterie, and wacky tacos), The Jeffrey aims to be everything to everyone and sticks the landing. 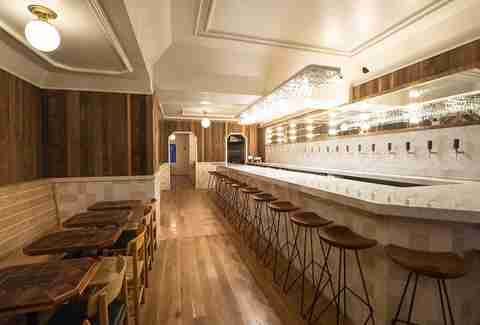 The bright, neat, attractive little taproom serves 16 draft beers to customers bellied up to its white marble bar. 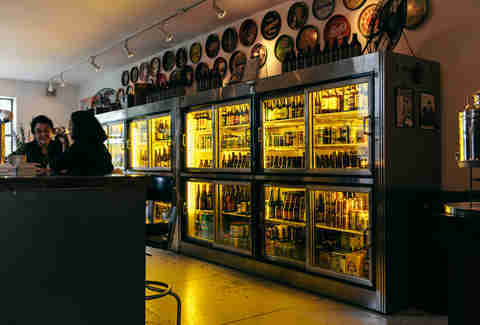 More than 200 bottles are kept in rotation, so select a six of something rare from the grab-and-go fridge and be on your way, or pay the $3 pouring fee and take a load off at a table with some empanadas or a BLT, and watch Myrtle Avenue through the big floor-to-ceiling storefront windows. Proletariat’s posture is that rarity fosters appeal, and frankly, the alchemy of scant bar real estate, limited beer selection (relative to other craft bars), and a just-this-side-of-divey ambience does indeed make drinking here feel like lunch at the cool kids’ table… albeit way more welcoming. 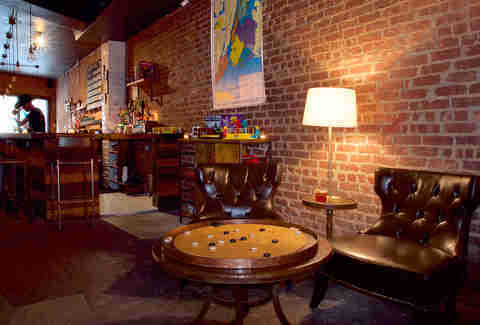 The space may be more modest than other Manhattan establishments, but it’s intimate like a secret, and every brew on offer is unique and provocative. Julien Levy is a contributor to Thrillist.